Yesterday The Gateway Pundit posted an article about non-citizens voting in Texas. Project Veritas dropped an undercover video earlier Tuesday showing election officials admitting “tons” of non-citizens are voting in Texas. 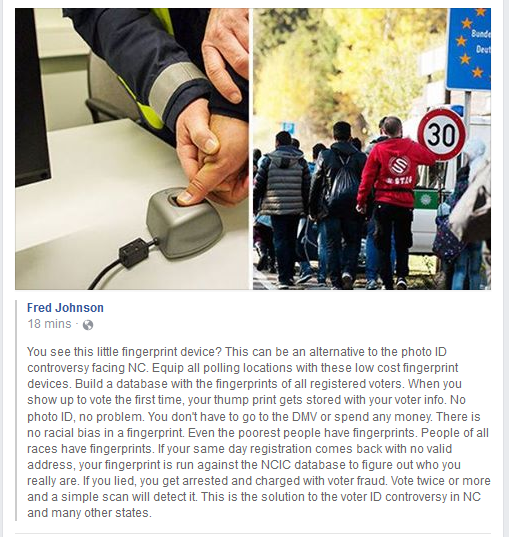 Unfortunately voter identification laws will not solve this problem–the young man had an ID and was registered to vote despite the fact that he was not a citizen. I am not sure if Texas has a way to track individual voters, but all votes from non-citizens should be disqualified. Thank you, Project Veritas, for the work that you do. It kind of makes me wonder what in the world is going on when I see someone opposing a voter integrity group. Does the group oppose the idea of honest elections? The Washington Free Beacon posted an article today about group that is opposing voter integrity lawsuits. Oddly enough, one of the leaders of the group is Senator Elizabeth Warren‘s daughter. The group is funded by George Soros. The Public Interest Legal Foundation (PILF), an Indiana-based legal group that litigates to protect election integrity, filed a lawsuit against Wake County, N.C., on behalf of Voter Integrity Project NC, a research organization dedicated to fair elections, after the county had failed to accurately maintain their voter rolls. A motion to dismiss the lawsuit was filed February 21 by the Wake County Board of Elections and three attorneys. Senior U.S. Judge W. Earl Britt ruled in favor of the Voter Integrity Project and denied the request. Cameron Bell, a legal fellow at Demos, is assisting the attorneys on the case. One of the main goals of Demos is to reduce the role of money in politics and to guarantee “the freedom to vote,” according to its website. Demos received hundreds of thousands in funding from George Soros’ Open Society Foundation. Individuals from the Southern Coalition for Social Justice, a progressive nonprofit in North Carolina, are also assisting on the lawsuit. The Southern Coalition for Social Justice has also received funding from Soros. I will admit to being a fairly simple person, but it seems to me that if a county has more registered voters than it has live citizens, there might be a problem with the voter rolls. It would also be interesting to know what the percentage of actual voters was. I would like to note that in the 2016 presidential election, the early voting turnout in Wake County broke all previous records (story here). Since most voter fraud occurs in early voting and same-day registration, that is an interesting statistic. Broward County (Florida), like Wake County, has more registered voters on their rolls than the number of eligible citizens who can vote in 2014, PILF said. Cameron Bell, the Demos attorney who is involved in North Carolina, also interjected in Broward County. In addition to Bell, Scott Novakowski and Stuart C. Naifeh, counsel from Demos, are involved in Florida. Individuals from Project Vote, a nonprofit that formerly teamed up with the scandal-plagued and now defunct Association of Community Organizations for Reform Now (ACORN), are also in Broward County. Demos and Project Vote additionally wrote amici in a Philadelphia lawsuit but has not intervened. Democrats have scrambled to build up a massive network to counter voter integrity efforts after Donald Trump’s victory over Hillary Clinton. Voters are disenfranchised when there is voter fraud. It is time for Americans to take action to protect the integrity of their elections. Voter ID laws are needed. When an area reports 105 percent turnout, there is a problem. The media was outraged. How could he say such a thing? Maybe because it was true? Yesterday The Gateway Pundit posted an article about the illegal alien vote in America. A 2014 study found that 25% of illegal aliens polled were registered to vote. The study found that 6.4 percent of non-citizens voted in 2008 and 2.2 percent voted in the off-year 2010. The vast majority of non-citizen votes went to Democratic candidates, according Earnest and Richman. If only 2% of non-citizens voted in a population of 20 million non-citizens in the US we are talking about 400,000 illegal alien voters. And that is on the low side. Illegals are already deciding elections. We not only need voter ID, we need to make sure that those voters with identification are American citizens. Just as an aside, True the Vote and its founder were targeted by the IRS during the Obama Administration in an effort to intimidate them and discourage them from investigating voter fraud. In the last state legislative session, North Carolina changed its voting laws to ensure the integrity of its elections. Photo ID will be required in 2016, there will be no more same day registration, and voters will be required to vote in their own precincts. The reasoning behind these changes was simple. Voter ID prevents a voter from being disenfranchised by someone who casts an illegal vote. Same day registration does not provide a way to check to make sure someone actually lives at the address they state. As I recently reported, a friend of mine who lives in North Carolina checked the voter registration rolls a few weeks ago and found out that there were six people who claimed her house as a residence, but did not live there. That is potentially six illegal votes cancelling out the votes of legal voters. Requiring people to vote in their own precinct ensures that they receive the appropriate ballot. Precinct ballots vary according to local offices being filled, obviously, voters need to vote for their local officials–not someone else’s. The idea behind the new law was to secure the right of voters to an honest election. Unfortunately, some of that law was recently struck down by the U.S. Court of Appeals for the Fourth Circuit. According to the U. S. Supreme Court blog, the Fourth Circuit judges felt that the new laws would limit the black vote. I guess I’m a little dense, but it seems to me that if it actually limited anyone’s ability to vote (which it doesn’t), it would limit everyone’s ability to vote. Registering to vote is easy–it can be done five days a week at the Board of Elections or when you get your license. Advance registration gives the Board of Elections time to confirm your address. Voting in your precinct should not be a problem as your precinct is determined by where you live–therefore the voting place should be relatively close to your home. Well, now the U. S. Supreme Court is involved. Justice Ginsburg, writing for herself and Justice Sotomayor, argued that the two restrictions at issue as well as others in the broader reach of the new law probably would have been found illegal, if the Voting Rights Act of 1965 remained in full effect and North Carolina had had to ask permission from the federal government to make those changes. The Court last year limited the 1965 Act in a way that the dissenters said “effectively nullified” the law’s pre-clearance requirement. The U.S. Court of Appeals for the Fourth Circuit found that the two provisions permitted by Wednesday’s Supreme Court order would risk a significant reduction in voting opportunities for black voters in North Carolina, in violation of a part of the Voting Rights Act still intact. Ensuring the integrity of the vote does not disenfranchise anyone–in fact, it ensures that legal voters will not be disenfranchised by illegal voters. Yesterday the Daily Caller posted a story about the need for voter identification. Generally speaking, the Democrats claim that the move toward requiring voters to have picture identification is designed to limit the voting ability of minorities. Well, one Democrat is destroying that argument with tales of Democrat voter fraud. We need more people to speak up for voter identification–honest elections are a very necessary part of our government.